Host: Dane… “The Gunmetal Armory” Audio player provided! This week on the GunMetal Armory, we go much deeper into the Armory where we store the Primitive Weaponry. 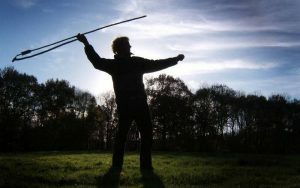 Our topics will cover things like the AtlAtl, throwing/thrusting spears, blow guns, clubs & impact weaponry, tomahawks & hatchets, knives, bow & arrow, arrowhead types, bolas, throwing sticks, slings, etc. Listen to this broadcast or download “Primitive Weapons” in player below! There are so many facets to the category of Primitive weaponry that the best way to discuss the subject is with a co-host/expert. So, Thursday night, Dane will be joined by a special guest… His friend and co-worker, Gregg. Gregg is a local Gunsmith, Primitive Weaponsmith, and a highly skilled, multi-discipline artist. Dane has personally seen many of the items Gregg has produced by hand, including 3 different AtlAtls with their bolts, multiple knives, 2 bows, multiple handmade arrows, war clubs, and a whole bunch more. This week, The Gunmetal Armory listeners will have the rare pleasure to learn from a true craftsman who keeps the primitive ways alive and creates beautiful works of art. Join us this Thursday at 9pm/6pm Pacific(7pm if you’re in AZ) to learn all about Primitive Weaponry, how its made, what types would be most effective for a grid down situation, their strengths and weaknesses, and so much more. So tune in and listen up as we travel ever deeper into the Gunmetal Armory. Previous: Previous post: Attacking the flu and an epidemic! Next: Next post: Dealing with Survivor Guilt in a Disaster!